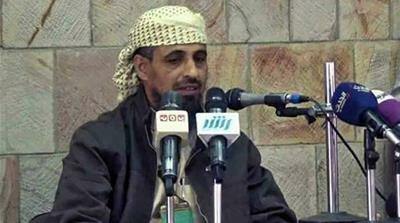 He is designated a terrorist by the United States, shares the same ideology as al-Qaeda, yet for more than three years, Abu al-Abbas, a Yemeni commander who controls most of the flashpoint city of Taiz, has been receiving financial and military support from the United Arab Emirates, sources told Al Jazeera. 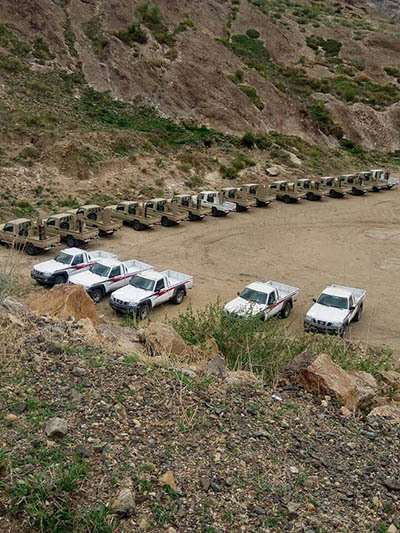 After purging the Houthis from Taiz’s eastern districts and killing dozens of Houthi fighters, al-Abbas’ forces now patrol the city’s streets with hi-tech US weaponry, arresting dissidents, reportedly carrying out extrajudicial killings, and instilling fear in the local population. Sources in the southwestern city have told Al Jazeera that the Kataib Abu al-Abbas (Abu al-Abbas battalion), has crushed any group that opposes its strict interpretation of Islam – including al-Islah, the Yemeni branch of the Muslim Brotherhood, as well as secular and pro-democracy activists. Al-Abbas, whose real name is Adil Abduh Fari Uthman al-Dhubhani, reportedly received more than 40 pick-up trucks from the UAE last year, worth an estimated $600,000, the sources said, despite him being sanctioned by the US for allegedly financing al-Qaeda in the Arabian Peninsula (AQAP) and the Yemeni branch of the Islamic State of Iraq and the Levant (ISIL, also known as ISIS). The sources added that based on communique issued by al-Abbas, he continued to receive political support from the UAE, including close military coordination with Emirati forces based in Aden. The information appeared to corroborate previous investigations by Al Jazeera (Arabic link), and reports by local journalists that the UAE was continuing its support for al-Abbas and his cadre of followers in its fight against the Houthis. Nicknamed “the German Tank” in his youth due to his competitive nature on the football field, al-Abbas was first introduced to Yemeni authorities in 2011 when he, and a group of Sunni Salafist students at the Dar al-Hadith seminary in Dammaj, began fighting against the Houthis. The Houthis, who follow the Zaydi branch of Shia Islam, had accused the Salafists, who follow a strict interpretation of Sunni Islam, of smuggling weapons into the seminary and attempting to proselytise the local Zaydi community. After three years of protracted fighting, the town and the seminary were overrun by the Houthis in 2014 when they launched their offensive across central and southern Yemen. Concerned that the Houthis were Iranian proxies looking to turn Yemen into a Shia stronghold, a coalition of Arab states launched a military offensive in March 2015 that included a massive aerial campaign. The Houthis denied wanting to turn Yemen into a religious theocracy, telling Al Jazeera that their decision to topple President Abd-Rabbu Mansour Hadi’s government stemmed from his decision to slash fuel subsidies in the summer of 2014, his failure to address Houthi demands during a failed National Dialogue, and his decision to push back long-awaited elections. When al-Abbas fled from Dammaj to Taiz, sources said he immediately established the Sunni militia named Hummat al-Aqidah (Protectors of the Faith) in an attempt to rally support against the rebel takeover of the city. Relying in sectarian rhetoric, his nascent group quickly began to grow. Within a few months, he would boast that thousands of fresh recruits had joined his group and that he managed to secure a significant number of victories over the Houthis in the eastern districts of Taiz city. With his popularity on the rise, President Hadi appointed al-Abbas to the rank of colonel, despite the 47-year-old never attending a military institution or graduating from school. According to multiple sources, it was shortly after this ascendency that al-Abbas began receiving financial and military support from the Saudi and UAE military. The sources said that al-Abbas had formed a close relationship with Hani bin Braik, a former minister of state and current vice president of the Southern Transitional Council (STC) – a movement demanding secession for southern Yemen. Al-Abbas’ forces were supplied with at least three trucks of weapons and ammunition, and his group was incorporated into the Security Belt – a UAE-funded force that has been accused by rights groups of arbitrary detentions and abductions. His forces commandeered state institutions as well as the Mogamma Hael school for girls which, to this day, is still be used as a base for their operations. Mohammed*, a member of the National Union in Taiz, said the Security Belt had knowingly recruited fighters from al-Qaeda and other armed groups, ignoring pleas from local residents. “We immediately rejected the Security Belt because it recruited men from al-Qaeda,” said Mohammed. “Look at what they did in Aden, look at all the assassinations happening there, the violations and the complete failure of the Security Belt to bring security and stability. The UAE has denied co-operating with al-Qaeda and designated al-Abbas a “terrorist” in conjunction with the US, Saudi Arabia and Qatar in October 2017. But there have been several reports, some as early as February 2016, of UAE-backed forces coordinating with al-Qaeda affiliates in the battle for Taiz. An Al Jazeera report from earlier this year found that when al-Qaeda left Mukalla city in 2016, their “sudden, bloodless withdrawal,” came after an agreement was brokered with the Saudi-UAE alliance. In July, Khaled Baterfi, a senior al-Qaeda leader, said his group had reduced attacks against Hadi’s and UAE-backed forces because assailing them would benefit the Houthis. The US, which provides the Saudi-UAE alliance with billions of dollars worth of military equipment, has long admitted that al-Qaeda had infiltrated anti-Houthi ranks. A senior US official told reporters in Cairo that the alliance had backed militias with “hardline Islamic commanders”, and it was “very, very easy for al-Qaeda to insinuate itself into the mix”. Nicholas Heras, a Middle East Security Fellow at the Center for a New American Security, said despite al-Abbas being a “militant Salafist”, he “fit perfectly into the UAE’s scheme in Yemen”. “The UAE quietly continues to support Abu al-Abbas because he is a power-broker in one of Yemen’s most important and strategic cities and can mobilise a lot of local men to fight against the Houthis,” Heras said. Al-Abbas wants to dominate Taiz and make it a model Islamic society according to his Salafist beliefs, and the Emiratis are willing to support him as long as he agrees to support them. Maysa Shuja al-Deen, a non-resident fellow at the Sanaa Center for Strategic Studies, said al-Abbas’ willingness to embrace al-Qaeda and other hardliners was due his simplistic understanding of the war-ravaging the country – a Sunni-Shia divide – one that fits the Salafist narrative and would be easily accepted by the Emiratis. In turn, this would allow the UAE to attain three of their objectives in the city, she said. “First, the UAE is reluctant to support the liberation of Taiz because it might give rise to al-Islah, a group it has listed as a terrorist organisation. “Second, fighting in Taiz allows the alliance to discredit the Houthis, by claiming that the Houthis are not fighting for patriotic or nationalist reasons, but are instead fighting for their own interests at the expense of other Yemenis. “Third, Taiz is geopolitically problematic. It’s connected culturally, demographically and politically to both Sanaa and Aden. This would cause a headache for the alliance where it to be completely liberated from the Houthis. Residents told Al Jazeera that after more than a year of being designated as a “terrorist”, al-Abbas continued to control key government buildings and issue declarations on behalf of the alliance. 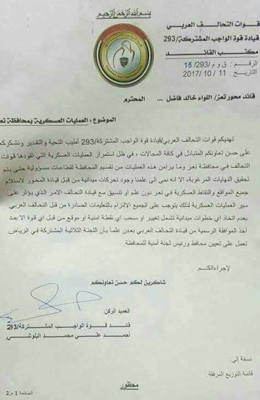 According to one document given to Al Jazeera, when al-Abbas was asked to cede territory to the Yemeni government, he reportedly contacted Emirati officials in Aden who in-turn told the Yemeni government to back-off. While the UAE entered Yemen’s war to restore Hadi’s government, sources said it had become more entrenched in the conflict and had repeatedly undermined president Hadi’s rule. According to several human rights groups, the UAE trained, financed and armed militias across the country’s south, set up secret prisons, and created a security establishment which answers to Aidarous al-Zubaidi, the leader of a secessionist movement backed by Abu Dhabi. 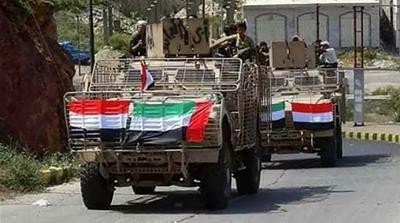 “Al-Abbas works just as well as a local partner for the Emiratis as South Yemen secessionist leaders do,” Heras said. “Because al-Abbas, like the South Yemen secessionists, is playing his own game on a local level, they [the Emiratis] know he needs the support of an outside power to win that game. Abdul Aziz Jabari, Yemen’s former deputy prime minister, said in an interview last year that he had once complained to President Hadi that armed groups in Taiz were “refusing to follow the government’s orders,” and were instead “receiving orders from Emirati officials”. Jabari resigned from his post earlier this after accusing the UAE of preventing Hadi from returning to Aden where his temporary government is based. Despite the UAE’s decision to classify al-Abbas as terrorist, sources said the Gulf nation was still treating him as a legitimate Yemeni leader. In August, state broadcaster Abu Dhabi TV characterised him as a “victim of al-Islah” when he was invited to participate in a phone interview one of it’s prime-time shows. Al-Abbas repeatedly lashed out at al-Islah in the interview, and in an earlier report accused the Muslim Brotherhood group of corruption and nepotism. Since al-Abbas’ claims first emerged in 2016, al-Islah’s Aden branch said it had been repeatedly targeted by unidentified “militias”. In a statement it said nine of its leaders had been assassinated, four arbitrarily arrested, and raids had been carried out on the party’s headquarters and on Islahi members’ homes. One Yemeni official told Al Jazeera that one of al-Abbas’ closest aides, Adel al-Ezzi, was responsible for several assassination attempts on al-Islah members, and al-Abbas decision to banish him to Aden in September could have been an attempt to mediate a truce. Al-Ezzi reportedly led the “single wolves” battalion, a unit which was responsible for a series of attacks blamed on ISIL’s branch in Yemen. “We’ve noticed a trend where the UAE supports extremist militias instead of the national army,” said Burhan*, a government official based in Taiz. “Instead of supporting the local authority represented by Taiz’s governor Ali Al-Mamari and Major General Khalid Fadhel, the Emiratis are turning to militias, something we simply don’t need,” he added. Will the midterm results affect Trump’s foreign policy?